It was busy in our corner of the Elan Valley today! First thing this morning some of the shepherds started gathering the sheep. By nine o’clock people had started to park cars on the grass opposite the house and unload ge ar, a large gazebo, chairs, water containers, back packs. All very puzzling, but it turned out that this was to be a check point and water stop on the Dragon’s Back race. 240 people had set off from Conway earlier in the week, running through Snowdonia and down the Dragon’s back of Wales. By the end of today there were about 124 runners left, and they still have a day of endurance to k eep working through until the race ends at Llandeilo tomorrow evening. 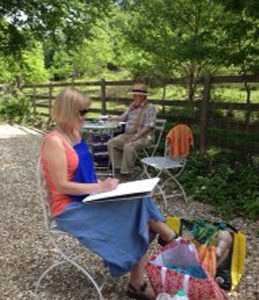 So that was the unexpected element, what we had planned was that a group of artist friends who meet together as the Arwystli Artists would gather at our home to draw and paint in our garden and the area around it. We had decided, towards the end of last year, that we would meet once a month and, regardless of weather, in different parts of Mid Wales. 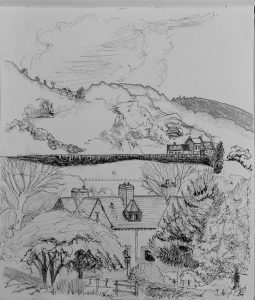 Our fir st event was in the rain on the front at Aberystwyth, where the image was being washed off my paper faster than I could draw it! A later one was on what must have been the coldest day of the year when we visited Montgomery Castle. It was bitter! 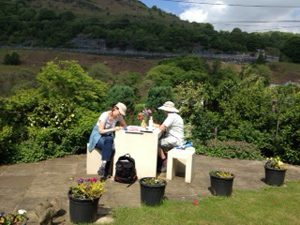 Last month I had suggested that we went to the Pales Quaker Meeting House at Llandegley, and then, this month to Ty Olaf in what turned out to be glorious sunshine. 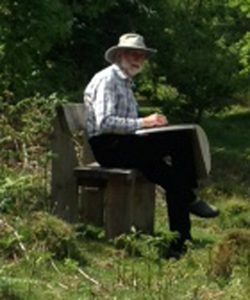 Here I am (below) doing my drawing, I had gone just a little way through the woods, looking down on one of the other Elan Village houses and over to the filter beds and Y Foe l. My drawing is also below. With runners running and painters painting local County Councilor, Kelvin Curry, turned up with huge Diamond shaped “Vote Liberal Democrat” signs for our fence. We had publicised Kelvins candidature, because he is our very hard working, sitting Councillor. So the present orange signs follow up on that decision. The absurd British system of first past the post, forces this sort of compromise. I would far prefer to vote Green, or Labour or even Plaid Cymru, but there is only one party in this constituency tha t has, in the past, kept the Conservatives at bay. Unfortunately the Liberal’s horrendous decision, to go into coalition and then to support University charges, led to the Conservatives winning the seat at the last election. It could be that they will manage to hold onto it again, this time, but using strategic voting feels like the only way forward.